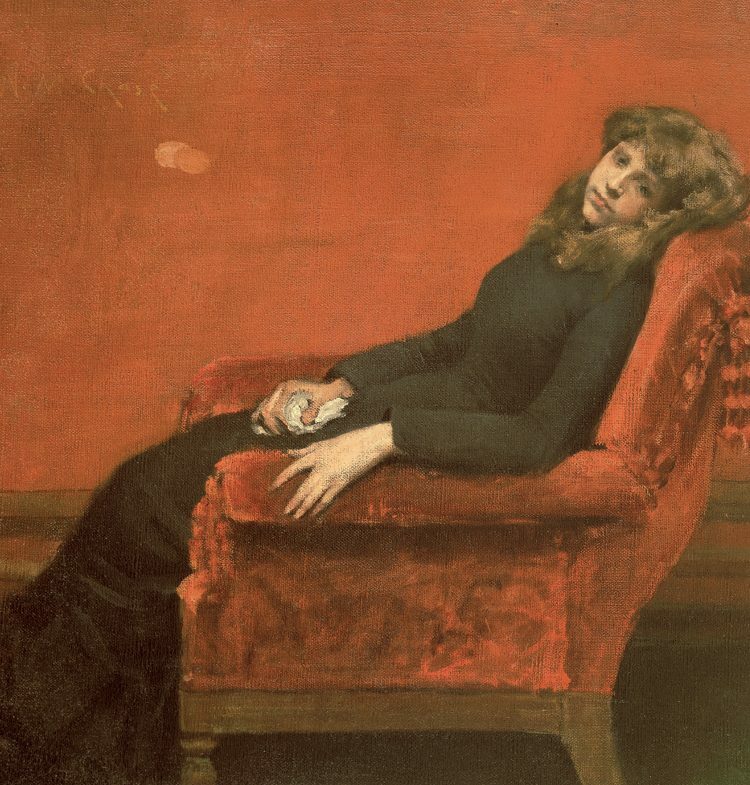 This article, written by “William Merritt Chase: A Modern Master” curator Elsa Smithgall, was first published by Yale ARTbooks Blog on June 22, 2016. The storytelling picture, of course, is an absolute impossibility, the picture that depends for its interest alone on the story. Imagine how impossible! We who have ever told a story, seek not to tell the same story to the same person the second time. Any subject could be made beautiful, declared Chase, but it was how that subject was painted and not what that subject represented that mattered most. With this in mind, the question of content is a fascinating one in the art of Chase. Without doubt, Chase sought to avoid the trite sentimentality or the staid quality of a fixed narrative that would grow old and lose its hold on the viewer. 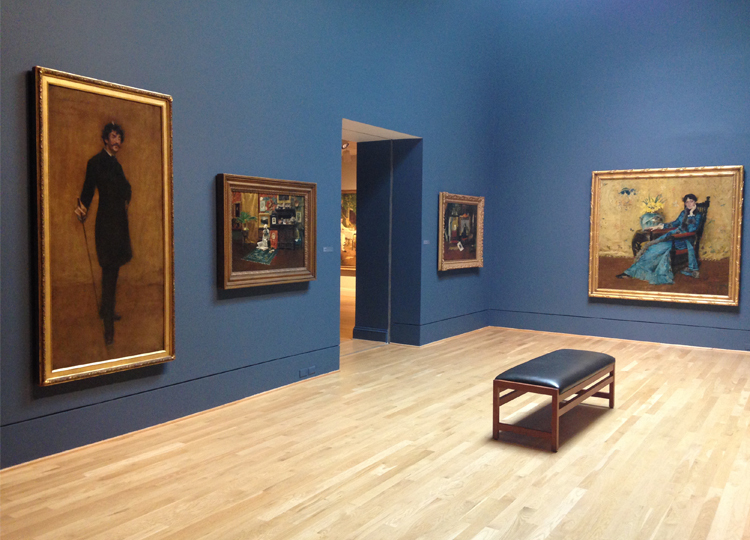 Perhaps with this motivation in mind, it is not surprising to find that in many of Chase’s finest interiors, he often instills a sense of drama, mystery, or ambiguity into the scene. 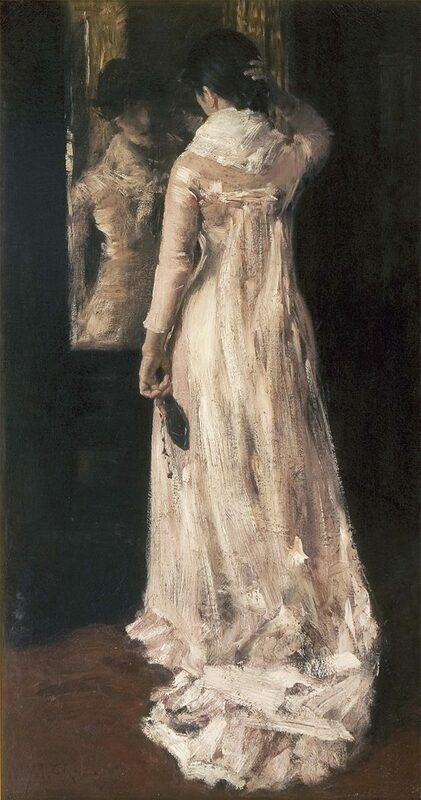 Consider for example, the painting “I Think I Am Ready Now” (c. 1883; Private collection) showing a woman in a pink dress before a mirror holding a hair brush in one hand and fixing her hair with the other. Darkness surrounds her suggestive form conjured out of thick brush strokes that mesmerize us as they reach a dramatic flourish in the abstract train of her dress. With her back turned, we encounter the subject from behind, glimpsing her face only through its reflection in the mirror. Through the title, Chase conjures an imagined dialogue between the subject and the unseen protagonist (the artist) who hovers outside the frame. In another equally captivating work called May I Come In? 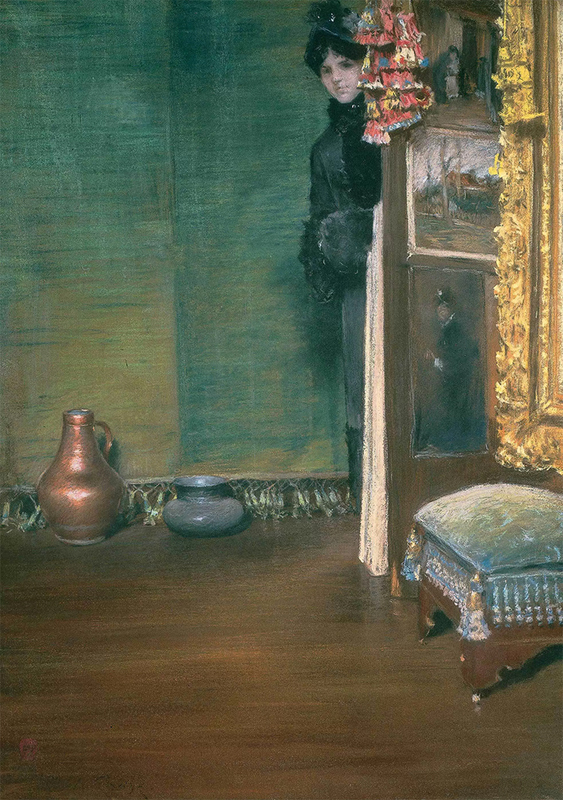 (c. 1883; Private collection), Chase entreats us into the picture with the title itself, if not visually with the woman peering behind a partially open door. 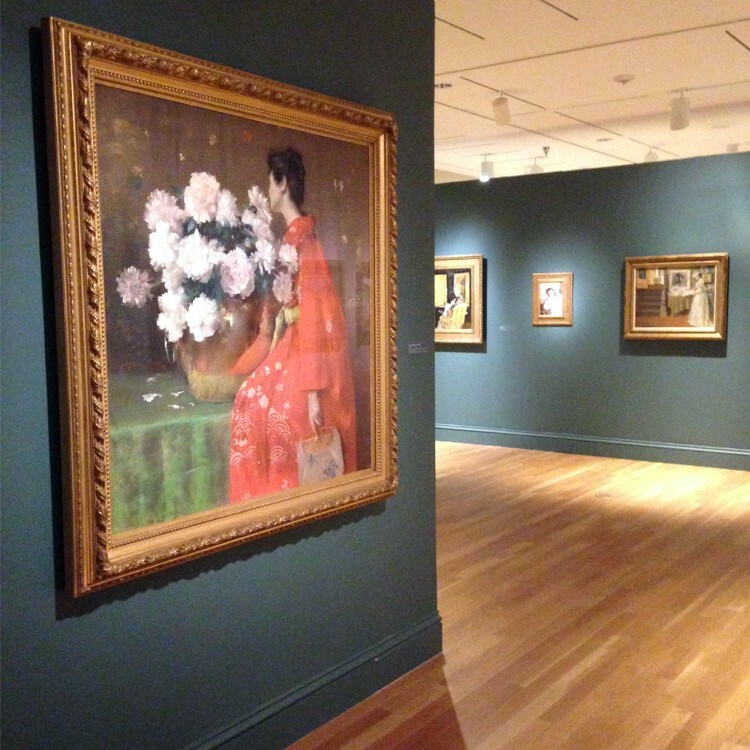 We traverse an empty, shimmering hardwood floor offset by a soft green hanging textile. No sign of the woman’s interlocutor may be found; instead our eyes settle on two discrete, carefully arranged shimmering pots on the floor that command center stage. 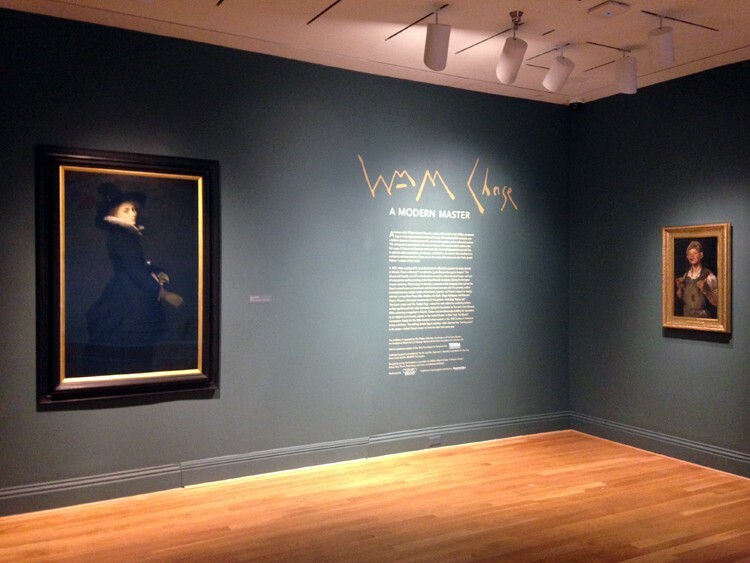 In this intimate space suggestive of the interior chamber of Chase’s Tenth Street studio, the woman appears reluctant to cross the threshold into the room itself. We too remain behind that door, our imaginations stirred by the anticipation of what will come—as our eyes seize upon the beauty of the surroundings—a red tassel dangling from a door strung with three framed pictures and a cropped portion of a gilded frame above a blue upholstered ottoman. A similar sense of the unknown lurking in our everyday life awaits the viewer in The Phillips Collection’s playfully beguiling Hide and Seek (1888). By framing the composition with the children posed from behind and their facial expressions masked from view, Chase heightens the emotional tension in the scene. 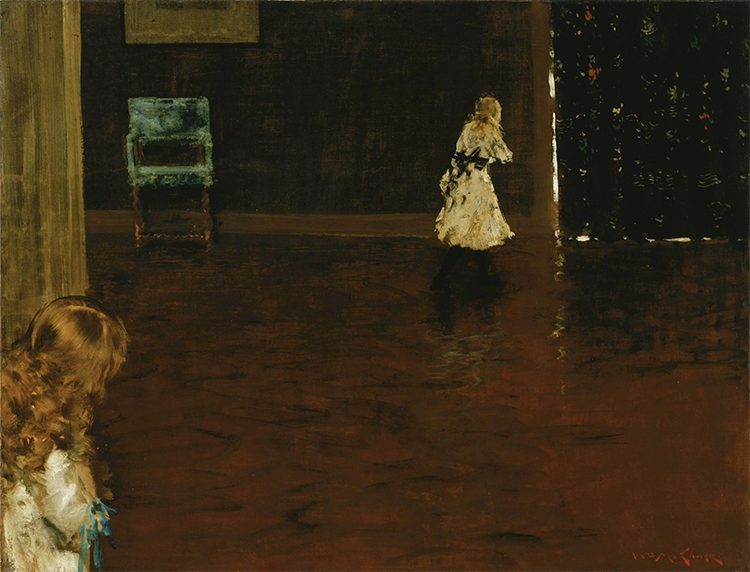 At the far left edge of the picture, the gaze of the young child leads the viewer to the ghost-like figure approaching a sliver of light spilling through a curtain. We witness the mystery of the deceptively simple game unfolding in a spare, dark-filled domestic space. Yet Chase fills that void with an intensity of color, subtlety of touch, and spatial complexity, all the while imbuing the work with striking, cinematic power. 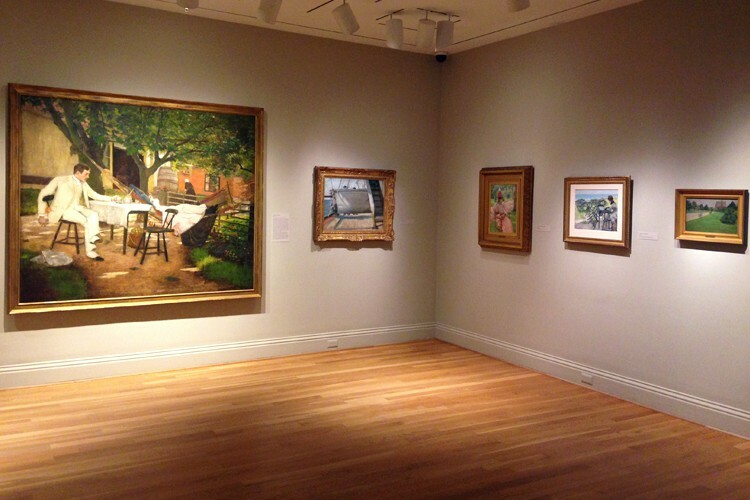 In such works as Hide and Seek, May I Come In?, and “I Think I am Ready Now,” Chase evokes a world outside the frame, a world shaped by his lifelong commitment to forging a personal artistic language with which to express his response to a changing modern world at the turn of the twentieth century. Perriton Maxwell, “William Merritt Chase—Artist, Wit and Philosopher,” Saturday Evening Post, November 4, 1899, 347.